Throughout its short life, FreeTaskManager quickly became a project management application. The more features we added to the product, the more obvious it became to us that FreeTaskManager had more potential that we initially thought. AceProject blossomed from FreeTaskManager’s seed. In early 2003, after the addition of time tracking and several other project management features, FreeTaskManager was officially transformed into AceProject. This software now boasts a wide and diverse set of customers, ranging “from small startups with one user only to large enterprises.” AceProject is currently used in over 50 countries and patronized by big name organizations like Intel, Goodyear, AT&T, IBM, Toyota, and Boston University. AceProject is entirely web-based software. It supports any recent version of Internet Explorer, Firefox, Safari and Google Chrome. If your organization requires additional storage space, you may opt to purchase extra gigabytes for $1/month. Be aware, though, that the maximum disk space for each account is 70 GB. AceProject does not require a contract, and users may cancel, upgrade, or downgrade their subscriptions at any point in time. However, once paid, monthly subscriptions are non-refundable. Annual subscriptions are not refundable after 14 days. The Basic plan, as long as it is used at least once every 30 days, remains active and free forever. Additionally, once you have subscribed to AceProject, your monthly fee will never change, regardless of future amendments to the “packages’ privileges or pricing.” This is a policy I would like to see more often in software providers, and I heartily applaud AceProject for their generous attitude. Discounts are offered for any subscriptions paid on an annual basis (10 months for the price of 12). AceProject also provides a 20% discount for non-profit organizations. Annually-paid plans may be billed via credit card, check or wire-transfer payments. Month-to-month subscriptions, however, must be paid with a major credit card. I have to say, I am impressed with AceProject’s pricing plan for one reason: they do not parcel out their features across the plans. Where other programs limit features in cheaper plans (I am looking at you, Wrike and Podio), AceProjects gives you everything, at all subscription levels. Granted, they limit your storage space and user numbers, but I like that no users will feel as though they have to pay extra for features when their team fits into a lower subscription level. Unfortunately, I must report that I disagree with some, if not all of those statements. The interface is more pleasing than some out there, but the term I would use to describe it isn’t “beautiful,” but “busy.” Yes, it is full of pleasing colors, and yes, it is peppered with flat design icons, but good grief, are there a lot of buttons to push! When compared with the likes of the admittedly fewer-featured Trello, it feels like stepping from a slick coffee bar into an overstuffed antique store. Maybe that kind of thing doesn’t matter to you. Maybe you don’t care software looks like as long as you can figure out how to work it. In that case…you may still be disappointed. While you can create projects and tasks in seconds in Basecamp and Redbooth, AceProject’s process is…well, I think the best word for it is bewildering. The thing is, the simpler problems I keep referencing are just that: simple. AceProject wants to be more than that. Basecamp, Redbooth, Trello – these programs are easy for a writer like me to understand in a few hours and then write about. I get the feeling that AceProject would take a few weeks to fully grasp. And fortunately, the team behind the software gets that. On your “dashboard,” AceProject gives you quick links to help videos and other support options (a smart choice on their part, considering the product is not one that can just be picked up and immediately used to its full potential). Saying that AceProject is easy to use would be, frankly, untrue. However, I think that it would become easy to use with practiced use. Once you conquer that learning curve, AceProject could become one of the best project management software providers in the business. Direct Support: AceProject offers free technical support to all customers (even those on the free, Basic plan) via phone, email, or live chat. Phone and live chat in English and French are available Monday thru Friday, from 9 am to 5 pm EST at 866.259.2454 (US/Canada) or +1.418.907.5184 (International calls). If you call within regular business hours, AceProject promises to answer the phone right away or “call you back asap. Not it an week, but in a matter of hours or even minutes.” This is an accurate claim, in my experience. Amazingly, technical support is still personally provided to users by the company’s founder and president, Daniel Raymond. Unfortunately, while my experience with the phone service was immediate and friendly, I found the live chat feature somewhat… nonexistent.. Even though I contacted AceProject within regular business hours, I received a notification that chat was unavailable. I am hopeful that this experience was an anomaly, as I eventually heard back from the customer service team via email. They took the trouble to track me down based on my name alone (no email address was given), which shows a dedication to customer service that you don’t see very often. Email Ticket: AceProject provides no fewer than five avenues for creating email tickets. In order to more quickly sort and answer your needs, you can submit tickets to Sales, Customer Service, Bug Reporting, Billing, and Enhancement Requests. I love the extra step AceProject provides here. Where other companies offer a vague promise that they will get you a good answer to your questions, AceProject takes the next step and allows you to send your requests directly to those who can answer them best. Help Page: This page gives you access to the AceProject Blog, an FAQ section, and a Guide Section. In terms of practical instruction and education, I found that the written help section is the most useful of these support tools. While it is certainly vast, the help section covers every imaginable detail of the AceProject features. The blog itself is pretty helpful, especially if you’re looking for information about updates and new features. The Getting Started guide also has merit, though it is perhaps a bit more relevant for the less computer-savvy; this beginner’s guide gives detailed instructions (with screenshots) about how to configure your account and begin creating projects. Videos: AceProject offers a selection of help videos available for their users here. After watching a few videos, I found them more or less the right length and as helpful as any video walkthrough can be. There is a lot of information here doled out in digestible chunks. Social Media Engagement: The AceProject Twitter feed has been pretty inactive, with the last tweet coming from February 2016 (almost a year prior to this version of the review). The software’s Facebook page is a little more active, featuring the standard run of press releases, articles, updates, and notifications about service interruptions. Even these updates are limited to once every few months, though. Free Plan Too Limited: Some users griped that the free plan, with its minuscule 1 GB of storage, 50 tasks, and 2 projects, is just too limited. This seems a wholly valid complaint, as no other program I have reviewed has limited the number of tasks a user can create. Seems awfully stingy, if you ask me. No Subtasks: Many of AceProject’s competitors allow users to further divide their tasks into subtasks. Unfortunately, this feature is missing from AceProject. Full-Featured: This software covers most of the usual project management bases (budgeting, file versioning, reporting, etc.) and functions at a much higher level than a typical task management system. Many users are especially impressed with the time and expense tracking features, which function smoothly. Flexible, Cost-Effective Pricing: By offering a free subscription option and charging – at most – only $99/month for paid plans, AceProject sets itself apart from competitors. There are very few other companies that offer such a full-featured program for such a low price. Custom Branding: The ability to customize a project management system is a real perk, especially when it comes to client relations and invoicing. Customers appreciate the fact that they can change the color scheme and logo of the AceProject interface and give it a more personal touch. Great Customer Service: AceProject representatives actually take the trouble to personally talk to their customers and don’t rely solely on email communication or service tickets, a fact which I and other users appreciate very much. Dashboard: Most project management solutions feature a dashboard where users can find their task lists, team communication, and the like. AceProject’s dashboard also includes a handy metric system informing you of the progress on your projects: which new tasks have been assigned, created, overdue, etc. I would go so far as to say AceProject’s dashboard is one of the best in the business. 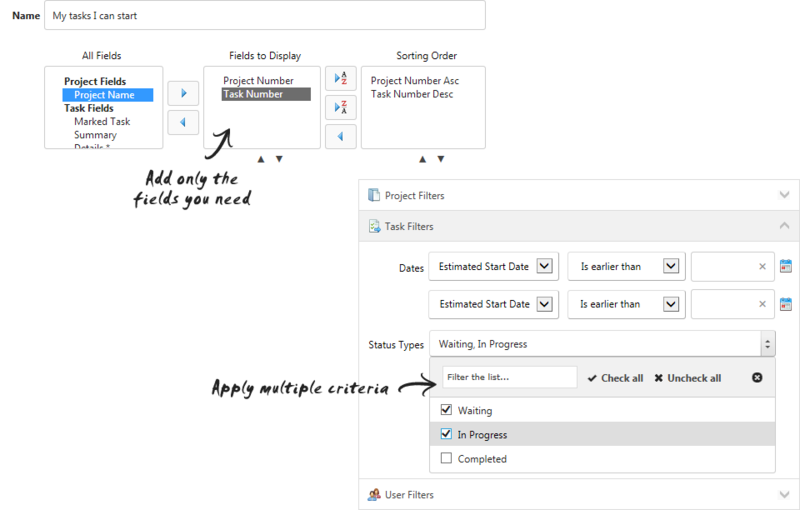 Projects and Tasks: As I have mentioned, it is not the simplest process to create new projects and tasks in AceProject. However, you can add a dizzying amount of details to both projects and tasks, including various kinds of projects, different groups, statuses, and priorities. Within each task, you can include estimates for both expenses and hours, as well as the comments and group assignments. Reporting: AceProject’s timing application allows for users to start timers while they are working, as well as after the fact, and then displays them for you when you click on the “time” button on the left-hand menu. Tasks and Projects are also full of options to track accounting expenses. To see them all in one place, use the Expenses button on the left-hand menu. Most handy, I think, is the Workload Metric. This allows you to see how many tasks and projects each member of your team is involved with, the better to efficiently allocate tasks. In a more general sense, AceProject also provides a “statistics” page, which is a more detailed version of the Dashboards graph service. Communication: Users can comment on tasks and projects, and also send each other messages via AceProject’s mailbox feature. Having said that, many of AceProject’s competitors do much better in terms of communication. I personally believe that communication is a key part of any team, and I doubt AceProject can meet all communication needs. Documents: Though storage space may be limited at the lower subscription levels, AceProject does provide a space for users to upload documents pertaining to projects. Unfortunately, these files have to be uploaded from your computer, as AceProject does not boast integrations with Google Drive, Box, Dropbox, and the like. AceProject has one integration: Bridge24. In a world where nearly every other program integrates with ten, fifteen, twenty or more add-ons, this seems like a pretty disastrous oversight. The software does offer an open API, however. You can find a video tutorial with more information about using the AceProject API on their website. Security Updates: Any available updates are applied as soon as possible in order to avoid system attacks, server instability, and malfunctions. AceProject has never been hacked. Secure Hosting: This software is hosted on “dedicated Dell R410 servers with Windows Server 2008 R2 64 bit technology, 48 Gigabytes of memory, a RAID storage system and Intel Xeon 5000 series processors.” AceProject also provides a mirror backup server. Frequent Backups: User data is replicated to a failover server every hour and backed up every evening on an external host. For more information about AceProject’s security procedures, click here. AceProject is a very decent project management solution, but overall I am more impressed with the company than with its product. Websystems treats customers with dignity and respect, does not overcharge for services, and provides a level of personal service that is hard to come by. I strongly support their decision to never raise the subscription rates of current customers. The product itself is slightly less impressive. Yes, it functions well and provides many valuable features, but I wish it was easier to use and more intuitively designed. The lack of relevant integrations – or any integrations, for that matter – is disappointing as well. That said, in my opinion, these flaws are not necessarily deal-breakers. AceProject’s cheapness and practicality cover a multitude of sins. Before purchasing a subscription, I recommend trying out the Basic plan for a while to familiarize yourself with the interface. This software is very good value for your money, especially if you can look past the labyrinthine design.